RSVPify. 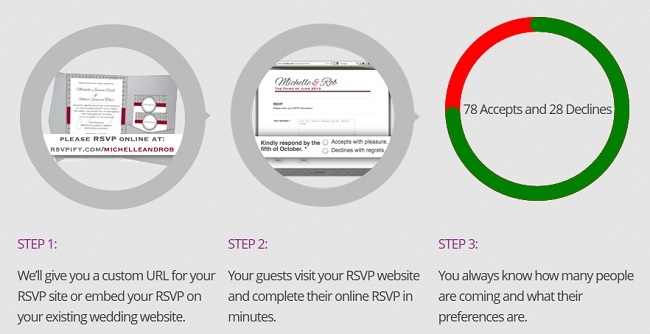 : Turning Event Planning Into the Next Successful Internet Business? It seems like a no-brainer, and indeed it is. There are numerous ways to send out Evites and invitations to family parties, corporate events, and ceremonies currently available on the web. However, in the current age of slick design and innovative practices, the emergence of RSVPify as a potent newcomer on the digital event planning market is a sign of the times. Coupling a well-designed interface and front-end site with enough creative and custom functionality to offer users something different from its established competitors, the fledgling company has already begun to gain significant traction in just its first few months. But when you enter an established market with a relatively simple idea, the secret must be in something else. And indeed it is. RSVPify has coupled an aggressive digital marketing strategy, integrating social media, SEO optimization, and consistent updates to site services to ensure its early success, along with a spree of good old fashioned word-of-mouth advertising. Marketed primarily as a wedding service, the site has since branched into a variety of events and celebrations, including bar and bat mitzvahs and a variety of corporate events. A recent trend in new ventures in digital service apps continues to be the focus on making users feel connected on a personal level, with local marketing and solid customer service. RSVPify has prioritized these two elements from the onset, and serves as a model for any small entrepreneur looking to break into an established market with a solid niche idea. The site also provides trustworthy usage and options for users. New customers looking to set up an event are welcome to use the basic RSVPify services for free, with a maximum of 100 invitees. Users looking for more comprehensive services can upgrade to an RSVPify Premium account for a one-time fee of $24.99, which gives users access to customization options and other additional features. The company is looking to develop a unique mobile app in the near future, and with considerable monthly user-growth it will continue its emergence. The combination of innovation mixed with good intentions towards users is another lesson we can take from this as entrepreneurs. If the recent U.S. health site debacle has taught us anything, it’s that nothing damages trust in a venture like poor service and shoddy management. The jury remains out on RSVPify for the present, but the future is starting to look bright. The mention of the environmental impact of saving on traditional paper RSVPs is featured front and center on RSVPify’s home page. While naturally a slick piece of marketing, this also serves as a reminder that every little touch going into a site’s design and user interface is critical. Designing the type of site that really appeals to a web user today (and you know the moment when you realize you’ve found a new site like this) is an important element of any new venture. Even if your business will not be dependent on custom Internet features for success, the fact remains that this is more often than not going to be the first impression a user gets of your venture. Maintaining a focus on web presence and customer impressions is one lesson we can take away from RSVPify, success or fail. The other is the focus on customer experience itself. Customer service, as has been lamented often, has taken a decided turn for the worse in the 21st century world of smartphones and Starbucks. It’s also a commonly forgotten aspect of the web experience as well, and RSVPify does well to maintain a focus on this too. Important questions and threats remain, of course, as the big fish in the market may limit the amount of growth this fledgling venture can reach. However, one way to maximize limited resources is to create ways to do essential tasks on the cheap (or the free, more likely), and this is the last takeaway we can pull from RSVPify. Focusing on communication with customers improves user experience. This can be done with limited investment on our end as entrepreneurs, making it a no-brainer idea to use in our personal ventures.